On the afternoon of May 28th the USS Potomac returned to Oakland from San Francisco carrying the publisher and staff members of San Francisco Magazine to Jack London Square. The event marked the launch of the June issuededicated to the City of Oakland and its people. No flag was planted and Oakland was not “discovered” as if by conquistadors. It was a celebration centered on the wide variety of people, politics and pastimes of Oakland. Location is still the most important consideration in choosing a home, but the meaning of location is changing. A growing segment of home buyers want something beyond the traditional amenities of good schools, easy commuting, and a tree-lined street. They want to know what they can do in their new neighborhood. They want to get out of the house and participate in the shared life of the community. While this applies to all of our East Bay communities, let’s just focus on Oakland this time. Food: Nothing brings people together more readily than food and drink. Consider the five most anticipated restaurants coming to Oakland, the Eat Real Festival coming to Jack London Square in September, and the ongoing Off The Grid food t ruck gatherings. Street Festivals: Some are annual events like theTemescal Street Fair on July 6, Oakland Chinatown Festival in August and OAKtoberfest on October 4. Others are monthly like First Fridays in Uptown. Sports: In addition to the three professional sports teams there are participatory sports like the Oakland Renegades Dragon Boat Team and the Oakland Running Festival. Volunteering: Improve housing and life for others with Rebuild Together Oakland or Habitat For Humanity, or preserve the environment with the Friends of Sausal Creek. What are your favorite activities in the East Bay? How did you discover them? Are you still looking for something special? We have a lot of contacts, and love to share information with others. So just send that e-mail or pick up the phone and let’s explore together. While we continue to experience a red hot real estate market, there are signs that activity is starting to slow. There is more inventory to choose from, with active listings up 30% since last year (supply). But with prices so high, the number of pending properties is down 25% (demand). As a result, sales are down 4% versus last year and prices are up 22%, but homes are selling 2.4 percentage points closer to asking at 6.7% above list. We continue to see high levels of competition for the right properties in the right location at the right price, but with more inventory to choose from, buyers can be a little more picky than before. Daring to be a Little "Cheeky"
Red Oak Realty ran a full-page ad in the June issue of San Francisco Magazine -- an issue completely dedicated to Oakland. We thought it was about time real estate marketing had a little wit. So what do you think? Did we go too far? For you East Bay residents, here's just one more reason paying a toll to cross the bay is completely unnecessary. The newest addition to Old Oakland, The Cook and Her Farmer, brings Tomales Bay oysters to a sun-drenched location where the tagline aptly reads "Gathering Together Around the Table." The menu is small, but perfect. They offer a fabulous spin on your usual kale salad, coupling it with quinoa and shrimp. The basket of garlic fries are perfectly accompanied with oysters and washed down with homemade lemonade. If you're OK with a little deep fried butter and cheese, the grilled cheese or the po boy sandwiches are worth the calories. The open kitchen, friendly staff and owners, and lively decor (aqua walls, red bar stools and a wide open wood block table for 10) guarantee a return visit. The Cook and Her Farmer, 907 9th Street in Swan's Marketplace. The homeowners among you probably have a treasury of information in a plastic binder, on a CD or on your computer. As you spend some time "spring cleaning," open up your records and travel back in time to see the house as it was when you bought it. Consider what you planned to change and note what progress you have made. Red Oak keeps a digital copy of your real estate transaction file for 5 years. You can request a copy of those reports if you can’t locate your own. Recommendations are readily available if you want to move forward with a project or to start with a fresh inspection. You are just a call or e-mail away from getting the information that you need. This newsletter is sent monthly to interested parties. If you would prefer not to receive this newsletter, you may opt out by clicking here. Tale of two markets: Our analysis focuses on Albany, Berkeley, El Cerrito, Kensington, Oakland and Piedmont (although we have data for the entire Bay Area). You’ll find that there are trends that apply to the market as a whole, but not necessarily to specific neighborhoods. Real estate is local, so the story can change depending on where you’re looking. Prices continue to increase. 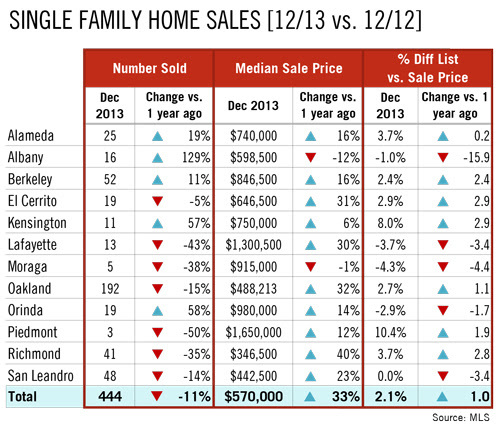 In Q1, the median price of a single family home increased 25% to $516,500. It is quite feasible that Q2 will break the East Bay’s all time record of $700,000 (set in 2007). In fact, Albany’s median price just broke its record at $748,750. Inventory is up. The story of 2013 was “low inventory,” but the number of active homes in Q1 was up 52% year-over-year. That means supply is up. But with prices so high, fewer people can afford homes, so sales are down in many parts of the East Bay with pendings down 36% and solds down 14%. With this increase in supply and decrease in demand, certain less-desirable neighborhoods will see a softer market. However, this does not appear to be the case with high-demand areas like Berkeley and Rockridge (more below). Distressed sales are at a 6-year low. Only 13% of transactions in the MLS involved short sales or bank-owned properties (REOs), the lowest since 2008. As property values increase, “bargain” sales are becoming less prominent in the East Bay. Competition is the norm. Homes sold an average of 6.1% above original list price, but this can vary wildly by city: Berkeley homes sold 12.0% over while Piedmont homes sold 1.7% under (expect this latter metric to increase in Q2 as more high-end homes come on the market). In total, 61% of all inventory sold above asking. Rockridge is hot. Looking at individual neighborhoods, Lower Rockridge and Upper Rockridge home values are on a strong incline. Lower Rockridge median price was $913,000 (up 24% year-over-year) and Upper Rockridge was $1,325,000 (up 28%). The greatest increases in price were in Eastmont in Oakland (97%), Belding Woods in Richmond (65%) and Iveywood in Oakland (60%). The East Bay is hot. East Bay zip codes were some of the most competitive in the entire Bay Area. In zip code 94705, homes sold 31% over asking, with 94709 (18%), 94703 (16%) and 94708 (15%) close behind. This rivaled the hottest San Francisco zip codes like Noe Valley (94110, 16%). The East Bay is still a “bargain.” Part of the reason the East Bay is so competitive is that it is relatively inexpensive compared to other Bay Area cities. For example, median price of a 3BD single family home in Berkeley was $815,000, but San Francisco was $1,020,000 (25% higher), Mill Valley was $1,147,500 (41%) and Palo Alto was $2,190,000 (169%). Noe Valley vs. Rockridge. A 3BD single family home in Lower Rockridge will cost you, on median, $1,237,500. In Noe Valley it will cost $2,200,000. That’s 78% higher. So while The City is great, just think what you could do with that extra $962,500! Feel free to download this comprehensive report here (32MB PDF), but if you would like a custom report specific to your neighborhood, just click reply and ask! The analysis written at the top of this email covers January through March (Q1). The chart immediately above is for April only, which allows us to see how the spring market is evolving. Prices continue to increase, up 9% versus one year ago. With prices so high, fewer people are in the market. As a result, the number of units sold continues to decline, down 10%. Competition remains fierce with properties selling 7.5% over asking, but it's even higher in particularly desirable cities like Berkeley (20.2%) and Piedmont (17.3%). 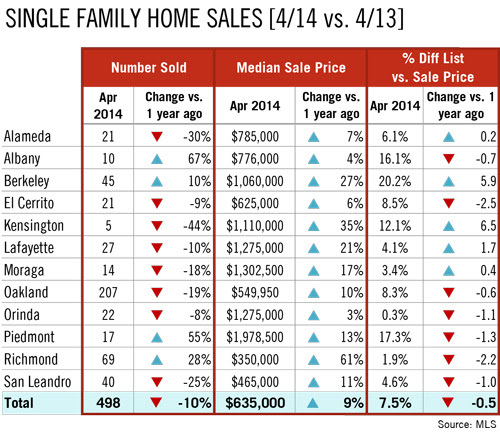 With trends like these, we expect that the East Bay's median price will reach an all-time high in Q2. It's a great time to be a seller, and a competitive time to be a buyer. April’s nonfarm payroll report from the Labor Department blew past the most optimistic projections of analysts and economists. According to data compiled by the government, the economy created 288,000 new jobs last month. It was the highest initial reading for payrolls since May 2010, though after revisions, it was only the highest since 2013 according to analysis done by Theodore Littleton of Thomson Reuters. Employment gains were broad-based across most industries. So far in 2014 the economy has gained an average of 214,000 jobs per m onth, well ahead of the 2013 pace of 194,000. March and February headline payroll numbers were revised upward by a collective 36,000 new jobs. The national jobless rate fell from 6.7% in March to 6.3% last month. Many economists pointed out that, while the national jobless rate did fall, it did so for the wrong reasons. Hundreds of thousands of workers abandoned the labor market. Moreover, the declines in the labor force participation rate occurred across younger age groups and was not the result of accelerated retirement for older workers. The participation rate, which indicates the share of working age people in the labor force, decreased to 62.8%, matching the lowest level since 1978. The reaction to positive economic news is generally a move from the safety of bonds to the attractive growth opportunity of stocks, resulting in higher interest rates. This affect has been muted recently though, as concerns about Russian moves in Ukraine have equity markets concerned. Continued economic growth or a peaceful resolution to the situation in Ukraine will likely drive rates higher, while more conflict or negative economic news will likely drive rates lower. De-cluttering is an important part of preparing your home for sale. But let’s assume you don’t plan to sell – you plan to stay but wish you had a little extra space. Consider looking inside -- within the walls of your home and your own living style -- to find more space. How do you get it done? Home organization is a thriving business, whether it’s your local professional organizer (happy to give you referrals) or big box stores that offer to solve your problem of too much stuff by selling you more stuff. Cluttered closets and garages are not always storage. They might be stagnant pools of procrastination. You could just wait for the tsunami solution, when the camera crew of “Hoarders” arrives at your door, or you could look for a few streams of disposal that will help you unplug your storage stoppages. Give family and friends first choice, but make them take it away. Donations to charity add a dimension of inner peace to your inner move: Elizabeth House(women’s clothing and household goods), Mercy Retirement Brown Bag Program (grocery bags),Loved Twice (baby clothes), City Slicker Farms (garden supplies), and Berkeley Food Pantry(canned and dried food). All of these organizations, by the way, are grant recipients of the Red OakOpportunity Foundation (ROOF). There is always the old stand-by garage sale. Online sales are the trend, like eBay and Craigslist. 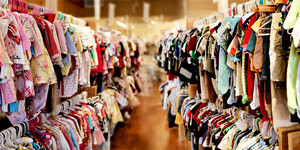 Consignment shops take a commission, but they also do all the sales and display work for you. The East Bay is blessed with a wide variety of specialized recycling and disposal options. Check out the options for computers, metals, even toxics. And, when all other options have dried up, accept the fact that some things just have to sail down river to the landfill by way of your trash can. And of course, you know who to contact for an honest assessment of selling your home, leaving your cramped rental, and purchasing the space you need. Your questions are always welcome. 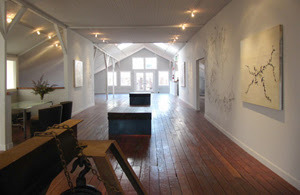 VESSEL GALLERY is a unique art space in Oakland's Uptown neighborhood. As a 30-year resident of the city, owner Lonnie Lee is an active Art Murmur participant, but she is also passionate about developing relationships with artists and collectors and helping to build noteworthy quality art collections with collectors of all stripes, new and seasoned. And the passion shows: she has won local awards for “best gallery” for 3 years running. The gallery is a perfect resource for purchasing distinctive contemporary artworks by California regional and International artists. VESSEL offers art consulting services should you need artworks for your home, office, garden, private and public spaces. You'll find rotating exhibits including site-specific installations, paintings, sculpture and fine jewelry. Currently you'll find works by Keiko Nelson, which reveal a deep interest in nature and texture. The gallery is located in an historic building: showcasing art and equipped with with an urban rooftop garden, it doubles as a chic space for event rentals. 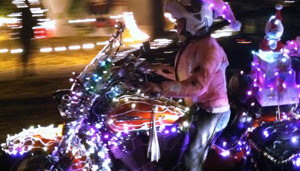 VESSEL GALLERY, 471 25th Street, Oakland; open Tue-Sat 11am-6pm and first Fridays 3-9pm; 510 893 8800. If you've purchased or sold a house in the past decade, you'll know the joys of the thrilling but all-too-necessary disclosure packet. Not too long ago they arrived in paper form with a resounding thud on our desks. Now they quietly pop up in our e-mails. But for better or worse, they're more important than ever. So how should you approach 300 pages of documents? Take time for thoughtful and thorough responses. There might be some skeletons in the closet, but exorcise them now so that they won’t haunt you later with a demand for concessions, a failed escrow, or worse. Your duty to investigate is limited. You don’t have to look for tracks when your neighbors tell you they saw Godzilla in your driveway. But don’t dismiss it. Buyers would probably like to know that prospective neighbors see giant reptiles on occasion. Understand that you are responsible for investigating the condition of the property to your own satisfaction. Even a well-prepared set of disclosures will miss something that might be of importance to you. Read the documents. Don't rely on some other person's summary, even your Realtor’s. Tedious though it may be, every paragraph is there for a reason. Get professional opinions on technical questions. And get real estimates, not guesstimates. Opinions are cheap; mistakes are expensive. Sometimes these packets contain information that is confidential and sensitive. That’s why we Realtors don’t give them out indiscriminately. There is no insult intended to the casual visitor who is just curious. However, packets should go only to bona fide prospective buyers, and that is best done by sending it to their Realtor. Is there something real estate related that you need deciphered or disclosed? Just call or e-mail. Questions are always welcome. This year, March stats were a mixed bag. Prices continued to climb, up 37%, but competition and sales were down, with 17% fewer homes closing, at 0.8 points closer to asking price. This type of fluctuation is typical for March, as the market comes out of its winter slumber and moves towards its spring peak. From our vantage point, competition remains fierce for the most desirable properties, and we have already seen supply and demand increase as we progress through April. What does this mean to you? If you're a seller, it's a great time to get your property on the market. If you're a buye r, stay on top of current market trends so you know how much to offer over asking, especially in difficult, multiple offer scenarios. Drop us a line if you have questions! With the return of the housing market comes the return of the remodel market. While Lowe's and Home Depot's stock prices have doubled, there's still a way for the average homeowner to get a bargain. These savings come in the form of rebates and tax incentives for energy efficient remodeling. It's important that you consult your CPA on the viability of these rebates in relation to your personal situation, but here are a few resources to get you started. Energy Upgrade California: This is the easiest program to utilize in that it assigns points to various energy saving upgrades ranging from installing new windows to insulating your attic. Credits can add up to $4,500 in rebates. See energyupgradeca.orgfor more info. Home Money Saver Program: With this program, PG&E will actually send you a rebate check for each appliance that you replace with an Energy Star-rated appliance. Rebates range from $25 for an air conditioner to $75 for a refrigerator. See pge.com for more details. Consumer Energy Efficiency: This one may be a stretch to the average homeowner, but anyone willing to upgrade to geothermal, solar or wind energy can receive a federal tax credit of up to 30% of the entire project cost. See energystar.com for more details. Remodeling your home can be one of the easiest ways to increase its value. For more information on these programs or remodeling in general, don't hesitate to contact me. The economy created 192,000 new jobs last month – about 8,000 fewer than most analysts anticipated and significantly fewer than the “whisper” number of 250,000 that was floating around in the market. The unemployment rate was unchanged at 6.7% as the inflow of workers into the labor force roughly matched the increase in employment. Mortgage rates are continuing to trade in a very narrow range, as they have all year. Investors are still waiting to see if who will win the debate between the bullish investors who feel that the economy is starting to show real growth, and the bears who believe that weak job growth and underemployment will lead to a stagnant or retracting economy. Homestead is a true farm-to-table restaurant served up with some of the friendliest wait staff in town. The rustic decor, coupled with fabulous natural lighting, would have you hardly believing that you are sandwiched between a parking lot and an alleyway, but alas, that's how things work here. These folks have the ability to transfer the essence of dining a la carte in Napa to right here in Oakland. The specials of the day are set out in heaping bowls displayed in front of the open-faced kitchen, creating a downright homey ambiance. It's as if Gramma was about to serve you a gourmet meal. The menu is small but robust. The bite-size potato pancakes were an absolute delight, and the champagne-poached halibut tasted li ke it had just been hauled from the sea. Stopping in without a reservation, mid-week, although packed, did not seem to present a problem. So if you are thinking of trying something thoughtful and new, make sure to add this to your list. Homestead, 4029 Piedmont Ave, Oakland, 510.420.6962, open Tue-Sat 8am-12pm and 5pm-10pm. Every place has its problems. We have our drought, but we still appreciate our mild climate as we hear reports of severe winter weather elsewhere. What's more, our market doesn’t freeze over like other regions. Our version of Spring Market usually starts before Spring Training, and is certainly well underway during March Madness. So what should you watch out for as the Spring Market heats up? Buzz words are easily acquired and frequently heard. Amuse yourself at a social or business gathering by listening for them and marking imaginary boxes like “bidding war,” “bubble,” “curb appeal,” “shadow inventory,” and “fixer.” (Of course check three boxes when you hear “location.”) Real estate BINGO cards now include “low inventory,” meaning that demand exceeds supply. By inference it also means that prices are being driven up by multiple buyers competing for limited housing. That might be changing. It’s true that competition persists on choice properties. But the latest local figures indicate a divergence between new listings rising slowly, and pending sales dropping at a faster rate. Even if there are still relatively few homes to buy compared with other times, a widening gap could result in leverage for buyers and pressure on sellers. Awareness is always an asset whether you are a potential buyer or seller. Change is likely to be gradual, moving toward a more balanced market. Buyers: Weigh hopes for better conditions against the likely reality of rising interest rates. Waiting might not result in a net improvement to your housing budget. Buyers: Don’t doze off to the lullaby of increased inventory. It might be a brief aberration in the charts, and it certainly does not guarantee more choices that meet your standards and needs. You need to stay awake to capture that dream home when it hits the market. Sellers: Pay close attention to pricing and preparation. When it’s done right, with the assistance of your Realtor, you can expect to receive the best offer the market can provide. Sellers: It’s never wise to take buyers for granted. An offer might not be perfect, but negotiation and cooperation can bring a satisfactory result for all. National and even regional headlines might not describe your micro-market as defined by location, size, price, style, and condition. Despite the parallels, buying and selling your home is not a game. It’s a serious life decision worthy of careful consideration with the best professional advice. Let’s follow your market segment together with frequent updates and adjustments so that you are well-prepared to move ahead confidently. Fewer properties tend to sell in February than any other month of the year. However, one year ago, the market was incredibly active: supply was low, demand was high, and homes were selling far over asking. In 2014, the market continues to be active and competitive, but not at the same levels as before. The number of active homes is 50% higher than it was a year ago, but 24% fewer homes are selling. This may be a reflection of lower buyer demand. However, prices continue to grow as they are now 28% higher than they were a year ago. Competition remains strong as homes are selling 2.1% over asking price, but this is 1.3 points below last year when the market was "on fire." We expect to see similar trends in March, but more a more conclusive analysis can be made once we reach April and we have entered the spring market in earnest. Mortgage investors have been busy revising down their expectations for the economy in the face of anemic job growth and less than encouraging economic data. The weather is being blamed for much of the slowdown, but many believe that the economy is still very fragile. Separate data from the private Institute of Supply Management showed their measure of activity in the service sector of the economy slipped to a reading of 51.6% in February from 54.0% the previous month. Details of this report were weak as well, particularly the employment index, which fell to 47.5% from January’s 56.3% mark. The Mortgage Bankers of America have released their Mortgage Application Survey for the month of February and the data shows recent increase in both purchase demand and refinance requests from the previous month. However, this is still lower by 63% from the year ago mark. Purchase applications have fallen 15.7% below where they were this same time last year. Many clients have asked about the remodel and temporary closure of our office on Solano Ave. in Berkeley. The short of it is that we needed to update our office to something more congruent with our style, and better equipped to handle the demands of today's real estate industry. As a green business, it gives us an opportunity to install the latest and greatest in energy-efficient products, and we've even had some fun experimenting with some innovative office designs. During the remodel, you can find us at our temporary office at 1600 Hopkins St. in Berkeley, the home of Northbrae Properties. It's been great working with our friends at Northbrae and it really shows that the collaborative spirit can work within the real estate industry. We're hoping to be settled back in our Solano Ave. office by mid-May, but in the meantime, feel free to stop by our office in Montclair or the office on Hopkins St. for anything you may need. Remember Somerset? It was an old school Rockridge restaurant – located right on College Ave at Chabot. It closed about a year ago, and recently it was replaced by a new, cutting edge restaurant, Box and Bells. 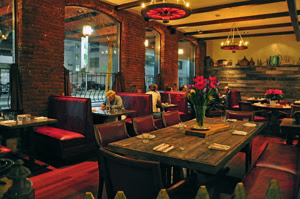 Founded by Michelin star-rated chef James Syhabout of Commis andHawker Fare fame, the simplest way to describe Box and Bells is “masculine.” The room is dark with spare red spotlights, and the food is meat-heavy (in a good way): from potted chicken liver to an intense dish of bone marrow. But there are fowl and seafood options, too . There’s duck breast, sea scallops, and fried chicken with raw oyster mayonnaise that’ll blow your mind. Add an impressive cocktail program and you’ve got a new mainstay on the College strip. Box and Bells, 5912 College Avenue, Oakland; 510.923.2000; open Wed-Thu 5:30-10:30pm, Fri-Sat 5:30-11pm, Sun 5-9:30pm. It’s that time again! The fifth annual Oakland Running Festival will be held on Sunday March 23. This is a great event for runners of all levels, from a full marathon to aKids Fun Run. The marathon course (PDF) takes participants throughout Oakland, from Fruitvale, to Lake Merritt, to Lake Temescal. Events start around 7:30am, with most of the activities clustered around City Center and the 12th Street BART station. This should cause few issues with traffic, but if you plan on attending, be sure to take public transportation. The Remodeling 2014 Cost vs. Value Report has just been released. It shows how much home value is added by doing certain remodeling projects. Interestingly, values rose nationally for every one of the 35 categories they track. The rising tide of real estate values has made home improvement a better investment. This is true nationally, in the Pacific states, and more locally for the combined counties of Alameda, Contra Costa, San Francisco, Marin, and San Mateo. Choosing remodeling projects will always be driven by the subjective and practical considerations of aesthetics, utility, and budget. But the measurement of average recouped value for the remodeling dollar is still a useful tool. Nationally and regionally the winner was the replacement of the exterior entry door with a 20 gauge steel model. The reported average returns were 97% and 113% respectively. No, these are not the clanging cage doors of Alcatraz or San Quentin. Fashionable, secure, and well insulated steel doors simulate a variety of traditional wooden doors. They are paintable or pre-painted in an array of colors. Counter-intuitively, by the way, 20 gauge steel is heavier and thicker than the 24 gauge found in your typical home improvement store. Quality counts; shop carefully. While not slamming the door on that idea, our local values register much differently. The Bay Area winner is the addition of a wooden deck, earning a whopping 171% gain over cost. Average investment was $12,339; average increased value was $21,919. The lowest regional and local return was on “sunroom additions” at 61% and 85%. Contrasted to the wooden deck addition, this probably reflects our mild climate and love of outdoors. The shocker is the low 60% return nationally on a bathroom addition. But let’s get personal. Averages, even Bay Area averages, do not dictate the best choices for your home and comfort. Even if you do play the averages, putting the deck in the wrong place or adding a high quality mid-century door to your classic Berkeley brown-shingle can actually reduce value. When you consult with a Realtor about remodeling, you get the perspective of someone who has seen hundreds of homes in your immediate area, and who is not selling you the deck, the door, or the installation. Perhaps you just purchased and the dust is settling, or you are assessing the need for a major overhaul on your comfy but outdated home. It doesn’t matter. Let’s get together and discuss what we currently see in the market, what’s in, what’s out, and what will work for you. January is typically one of the least active months of the year: the holiday "hangover", coupled with expected poor weather, means low supply and low demand. But an interesting dynamic may be emerging: sales were down 18%, but inventory was up over 50% versus last year. With fewer sales despite more homes available for sale, the market may be moving to the buyer's favor. That's why homes are selling 1.3 percentage points lower than they were a year ago. However, prices continue to increase, up 19%. Is this a sign of things to come? It's too early to tell. Interest rates will fluctuate and market activity will increase as we head into spring. Only then will we see how 2014 will shape up. It's rare in real estate that we talk about how a home makes us feel. Enjoying the East Bay, raising a family, making a life. Red Oak created a video that speaks to those emotions. Please watch, and let us know what you think. The economy added 113,000 net new jobs in January while the jobless rate edged down to 6.6% from the prior month’s 6.7%. Revisions to prior reports added a total of 34,000 jobs to the payroll headcount over the course of November and December. While the unemployment rate dropped, the January figures represented two consecutive months of figures that fell well below expected levels. In fact, it was the weakest two months for job growth in three years. Many blamed weather-related phenomena, but investors still fled to the safety of bonds which resulted in a continued rally in rates. Conforming rates, which had climbed to almost 5% a month ago, are now in the low 4% range, depending on the exact scenario. As you complete your taxes and reap the benefits from that interest tax deduction, why not show your home a little love for all that money you saved. And truthfully, these simple maintenance tasks will save you even more throughout the year. Walk around! Just walk a lap around your house and look for any open or damaged vents. This will help keep unwanted (and potentially costly) critters from entering your homes' crawl spaces. Switch to filters. Changing your furnace filters can reduce fire danger, capture more allergens and allow your furnace to operate more efficiently. Most filters are available at your local hardware store for under $20. Raid your refrigerator. 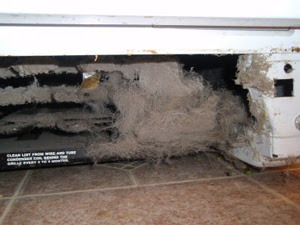 Vacuuming off dirty refrigerator coils helps to reduce fire danger and can significantly improve the efficiency of the appliance. Remember that volcano science project? Pour a half-cup of baking soda and a half-cup of white vinegar down your drains. Wait 10 minutes and follow it up with boiling water. It's an eco-friendly way to prevent calls to your plumber as well as awkward party moments. And that's it, just 4 simple tasks that your home will thank you for. If you are seeking some serious old-school Italian food, this may be the spot for you. This is the way they make food in the homeland. The menu selection changes frequently, and the portions are not overwhelming. The decor is warm and rustic - consistent with the meals they serve. The torta fritta (a savory warm bread) is an absolute must order. You can pair it with meats, butters and oils. Fabio the owner is becoming known locally for this dish as the word keeps spreading. The gnocchi and osso buco don't disappoint either. And afterwards you can burn off those carbs over an evening stroll on th e Jack London Square waterfront and pretend, if just for a moment, it's Cinque Terre. Centouno, 101 Broadway, Oakland, 510.533.5050, open daily 11am-3pm, 5pm-11pm. What an amazing year 2013 was! We were so happy to have shared so many moments with you buying, selling, talking, growing and most of all, building relationships. We are excited for the New Year ahead. We see changes in the market already. Rates have been steady but inventory is very low which has shifted the market trend. You can read about it more specifically below in the full article. 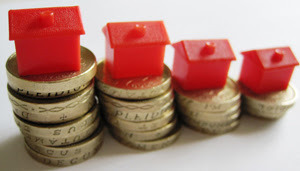 Many of our clients often ask us "What's my home worth?" "How do you know it's worth that price?" In this months article we have broken down the process just a little bit deeper to share with you how we come up with this information. We hope that's helpful. 2013 was a year of exploration and adventure for us. We explored home, cities and some new restaurants. One of our very favorite restaurants re-opened after many years of being closed and we are so delighted! We are very grateful for your business, referrals and friendships. We wish you a healthy and prosperous 2014! January should be designated as national hangover month. Offers for “cures” seamlessly follow December’s enticements to excess. Heavier topics like diet, exercise, budgeting, financial planning, taxes, and real estate quickly replace the bubbling exuberance of the holiday season. We will see a flood of articles listing the 3, 5, or 20 steps to buying or selling real estate. These will vary in value depending on how well they meet your particular and immediate needs. But all steps in the process will converge to a single point: value. What do you think my property is worth? What do you think I should offer on a property? Understanding the concept of value is essential for success no matter how many other items you check off a list. Value is an opinion and, like any other answer, the response will vary depending who answers and how the question is asked. Appraised Value: An appraisal is created by a licensed appraiser, usually at the request of a lender. Appraisers form their opinions based on a particular set of professional standards and the specific requirements of the lender or loan program. They look at closed sales, replacement cost and income produced. Replacement Cost: The cost to rebuild an existing property is most relevant for insurance purposes. It is also addressed in an appraisal, but an appraiser usually defers to comparable sales as the best method to determine market value. Income Analysis: Investors are interested in return on investment. Appreciation over time is a consideration, but so is immediate return on investment. They need to know how much income the property will generate and how much it will cost to own and operate it. Assessed Value: This number is usually based on the previous sale, and is used only for tax calculation. It is not a factor in determining current value. Closed Sale: The real answer to the value question, the one that everyone concerned ultimately wants to know, is the sold price. It is a fact; everything else is an opinion. When a property has been publicly marketed for sale, that closing price reflects both general market conditions as well as the specifics of that property. It is the result of a process that is best started with a CMA (see below). Comparative Market Analysis (CMA): The CMA is based on closed sales and market trends. It can be for an owner considering selling a property, or for a prospective buyer considering an offer. Either way it is only a starting point for a recommended listing or offering price. In our local market, the list price should not be set at the highest value. Rather it is carefully priced to attract the highest number of qualified buyers. On the buyer’s side of the equation in a competitive situation, past sales often represent a “floor” in determining how high to bid. The ultimate value will be shaped by the number of competing offers, inspections, repair bids, and the appraisal if the buyer is getting a loan for the purchase. A CMA is most valuable when it has been prepared by your own knowledgeable, local, and trusted Realtor. Are you curious about the current market value of your property or of one you would consider purchasing? Just call or write so that we can discuss your plans and review values together. In 2011 and 2012, December had been one of the strongest real estate months of the entire year. 2013 broke that trend, with the quantity of sales declining 11% year over year. However, prices continued to increase, up 33%, and homes selling modestly over asking, up to 2.1%. This is what we'd typically expect of December, with most buyers focused on the holidays (and in our case, warm weather). Looking forward, we expect to see a spike in inventory early in 2014. Sellers will be hoping that buyer demand remains strong, and we all hope that the inevitable increase in interest rates waits until late in the year. Rates have remained steady through the holiday season on the heels of the FED announcement in mid December. As expected, the Federal Reserve announced a volume drop in their latest round of quantitative easing (QE3) from $85 billion to $75 billion per month. The mortgage backed securities market had priced this in as rates climbed into the mid to high 4%s in anticipation of the announcement. Looking ahead to 2014, look for steadily higher rates if more positive economic news comes out, fueling po ssible inflation fears. Talking with a lender: Getting your credit and financial affairs in order can take a few weeks or a few months depending on your situation. Meeting with a lender is a great first step to help determine what you can spend. Talking with a Realtor: You should contact a Realtor long before you plan to buy or sell. We're happy to outline the process, educate you on market conditions and share any resources you might need in order to help you make decisions. Tax implications: While a Realtor can walk you through the details of the transaction, tax ramifications should be referred to your accountant. Selling or buying a home can have huge tax implications and it's a great idea to get straight answers early on in the process. A little homework on your own: While the Internet can provide you with many of the details, it's a great idea to actually visit a neighborhood you may be interested in, or visit other open houses in your area if you're planning to sell. 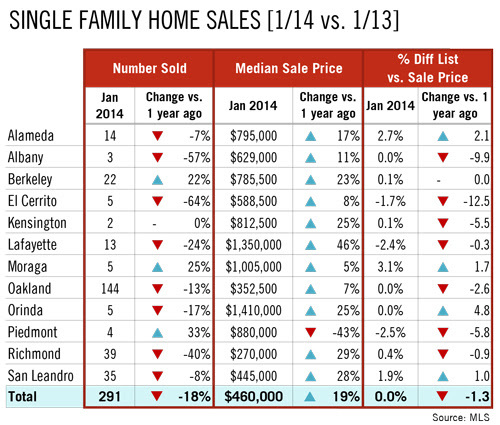 2014 is shaping up to be another great year for real estate in the Bay area. 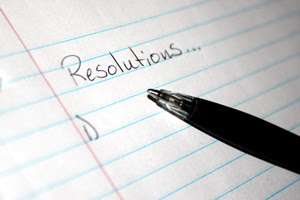 Please let us know if you have any questions about how to reach your 2014 goal. Great China has a long history in Berkeley as an authentic Chinese restaurant in the heart of downtown. Unfortunately a fire destroyed the building on Kittredge, and the restaurant has been closed for two years. But not all was lost: Great China moved to the corner of Bancroft and Oxford, and in the process they built a stunningly modern structure with high ceilings, exposed beams and reclaimed Redwood. The cuisine is primarily Northern Chinese, plus some Cantonese dishes, all made with locally sourced ingredients. Look for excellent Peking duck, crispy chicken, and lobster in ginger scallion sauce. And be sure to try the Buddha’s hand cheesecake made with Cowgirl Creamery fromage blanc. There's usually a wait, so if you're a party of six or more, call for a reservation. Great China, 2190 Bancroft Way, Berkeley; 510.843.7996; open Mon-Sun 11:30am-2:30pm,5pm-9:30pm. We are delighted to announce "We've moved!" We have re-joined Red Oak Realty! And we are excited to share our newsletter with you! Take a look~ let us know what you think! Don't miss the restaurant reviews, that's our favorite part! …and it’s not likely that the real estate market will take a long winter’s nap, at least according to 1,300 respondents to a survey conducted by Realtor.com for itsWinter Home Buyer Report. Among the top reasons these prospective buyers are motivated is their belief that they will have one or more of these advantages: motivated sellers, better prices, and less competition from other buyers. But 24% admitted that they will be looking in the winter because they were unsuccessful in the previous two seasons. These veteran buyers are not dazzled with visions of sugar plums. They know that they will face some of the same challenges that have frozen them out for over a year: in particular, a continued lack of inventory, either on the market or their price range. October housing data nationwide, as reported by Realtor.com, shows a strong market. "Instead of the usual seasonal slowdown, October data show the 2013 fall market moving at a fast pace," said Errol Samuelson, president of realtor.com. "Inventory has returned to last year's levels, but prices continue to strengthen and homes are moving significantly faster compared to this time last year." Locally, demand is even stronger. That same article lists the ten metro areas with the shortest median days on the market. Bay area markets hold the top three positions nationwide, with #1 Oakland beating runner-up San Francisco by 18 days (30 vs 48). The “Oakland MSA” should be read as East Bay, which includes all of Alameda and Contra Costa Counties. San Jose was 3rd, and one of California’s most depressed markets, Stockton-Lodi, held the 5th position. 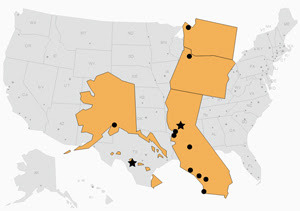 Denver was the only area outside of California to make the top five. Getting back to our off-season buyers, almost a third cited unpleasant winter weather as an obstacle, but keep in mind that this is a national survey. Although our days have grown short and many will be wet, we will not need a snow plow to get to a Sunday open house. Realtors will have booties and throw rugs ready for wet-footed buyers. With our market still so strong “wait until spring” is not the only option for sellers who are ready to sell. The sounds you hear from above could be roof and chimney inspectors instead of a jolly fellow with a team of reindeer. Buyers will still be out there willing to deck your halls with green, especially the 19% of winter buyers ready to make an all cash purchase. For buyers wintering over in the market, don’t expect a gift wrapped opportunity, but don’t give up either. Hang your stocking with care and a strong pre-approval letter. You might not be home for these coming holidays but, if you keep at it, St. Valentine’s Day could make a lovely start for you in your new home. Over the past month we have seen a decline in new listings but a consistent number of new contracts and sales. This reflects a decline in supply but a consistent level of demand. In market dynamics such as these, you get - as you see in the chart - a decline in sales but an increase in price. In November, sales declined 17% while prices continued to rise, up 36% to a median of $572,500. Additionally, homes sold 3.6% over original list price, further emphasizing our current "seller's market." We expect December to be relatively similar, closing out a year that may very well be an all-time high water mark for prices. The first week of December in the mortgage marketplace was one of the most action-packed weeks in 2013. The big news was that the economy added 203,000 jobs in November and the national jobless rate dropped to 7.0% from 7.3%. A separate report from the Commerce Department showed personal income unexpectedly fell by 0.1% in October while spending rose by 0.3%, indicating that consumers are dipping into savings to spend. Inflation at the consumer level, as measured by the personal consumption expenditure index, edged up a very modest 0.1%. Rates crept higher in anticipation of the improved economic outlook and continued to climb as the expectations were confirmed. All eyes are now on the FED meeting in mid-December to see if the much anticipated "tapering" of QE3 will begin. If the FED continues to "sit on its hands" and wait until the New Year before exerting any effort to close the tap on their $85 billion per month buying appetite for Treasury debt obligations and agency-eligible mortgage-backed securities, mortgage interest rates will likely trend sideways to perhaps fractionally lower into the end of the year. The year of 2013 showed a marked turnaround in the economy, and with it, an increase in the federal tax rate. As Ben Franklin so astutely stated, "Nothing is certain but death and taxes." Here are some of the most common ways that you might be able to ease this certainty. Purchasing a home remains one of the largest tax write-offs you can have. We all know about the mortgage interest deduction, but did you know that you can also write off any points you paid to obtain your mortgage? In addition, local property taxes and personal mortgage insurance are also 100% tax deductible. Just a reminder, you should ALWAYS consult your CPA before utilizing these tax breaks. Energy efficient upgrades in your home are also a great way to reduce your taxes while increasing the value and efficiency of your home. These savings take the form of a tax credit as opposed to a tax deduction. A credit is simply deducted from your tax liability dollar for dollar. Items such as energy efficient windows, water heaters and furnaces all qualify, as does a new roof! And speaking of ROOF, donating to the Red Oak Opportunity Foundation (in addition to any 501(c)3 organization like One Warm Coat or the Alameda County Food Bank) is a great way to reduce you tax basis while maximizing the power of your donation. For every dollar you donate to a local charity you save an average of 41% on that dollar, and more importantly, you help to maintain a community that is capable of supporting Bat Kid. For more information on the home buying process, or for info relating to one of the many deserving non-profits in the East Bay, please drop a line. Warning: This place is not for vegetarians! Instead it's all about the (seriously) local grass fed meat and milk fed pork. The concept is simple: The chef brings in one animal at a time and does his best to prepare meals using a variety of techniques that consume the entire animal. It's the perfect storm of sustainable, hyperlocal, low-carbon footprint foodie-ism. And when you throw in the affordability factor, you end up with a slam dunk. The only thing missing is enough seating, but that is made up for with al fresco picnic tables lining the sidewalk. The menu is small but delightful. If you are a first-timer, and have truly come for the marrow, you can't go wrong with "The Deal" – it’ s reminiscent of an In-and-Out burger, except grass fed and gourmet. 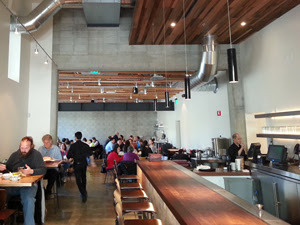 Marrow - 325 19th Street, Oakland - open for breakfast/lunch only, Mon-Fri 11am-3pm, Sat-Sun 10:30am-2:30pm.